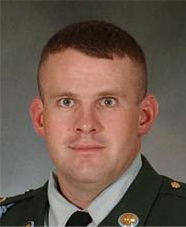 Army Sergeant Gary Boggs of the 1st Brigade, 4th Infantry Division (Ohio National Guard) was severely injured in Iraq on September 26, 2003 when his Humvee was blown up by an impro- vised explosive device (IED) of Tikrit. He was headed to Qatar for four days of rest and relaxation. As a result of the attack, he lost his left eye, ruptured both ear drums, suffered a minor traumatic brain injury and has nerve damage to my left arm and hand. Sergeant Boggs, who was pelted by shrapnel, was fortunate to have immediate support from soldiers in two other Humvees and an Apache gunship. He was evacuated to Baghdad, transferred to Kuwait, and then medevaced to Landstuhl, Germany for immediate surgery on his eye. He spent a week in Germany before arriving at Walter Reed Medical Center where he spent the next year and a half undergoing surgeries and rehabilitation. Sergeant Boggs's recovery was motivated by his desire to lead other soldiers by example. He's now a motivational speaker and spokesperson for a foundation that assists wounded veterans. He considers himself to be a light at the end of the tunnel for wounded veterans. His mission is to inspire and motivate them through his ongoing success story. He uses this position as a plat- form to tell his story and reach out to other soldiers to provide financial aid, family and career support. Sergeant Boggs is engaged to be married. He received a home in Naples, Florida.